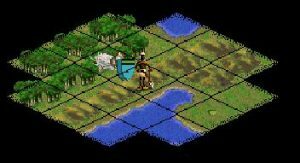 Discussion in 'Civ2 - Game of the Month' started by Magic_gorter, Mar 7, 2011. This month is a normal game but on a very small map. Games will be due on April 26th, 2011. Is this map custom designed or generated by the game? In the early days of my civ2 playing I tried to play on very small maps (1000 tiles is the smallest the game allows) and discovered that auto generated ones give you terrible very mountainous terrain. It was one of the reasons I got into designing maps myself. Resource seed is 30. Starting location is 1 special (no hidden specials under the grass). There is a 4 special site nearby but it may not be on land. Starting location is on continent 1 so black clicking is next to useless. OCC is a possibility. The starting location is not great but it is doable. Could you say more ? I don't know much about OCC, but at first glance, the starting location looks pretty poor. Don't you need more grass, specials, etc ? 1. There is ocean access. Unless you know the map apriori this is indispensable. 2. The one available special is a trade special which is what you want for OCC. Trade specials are best, followed by food specials, followed by shield specials. 3. Two grass allow you to get going initially while the second settler turns forests into plains. 4. Two initial settlers allow you to start on a mined hill which gives a nice shield boost which is quite valuable in early game. As soon as explosives are available engineers should be built to turn the hills into grassland. Of course, another possibility is to wander with the settlers in opposite directions to find a more suitable place. So, first of all, hi everybody! I have been playing Civ2 for about 10 years now, but just for fun and never really ambitiously (trying to land/conquer earlier or on higher levels, I sticked to king level most of the time). So a fews months ago I discovered I played soooooo wrong all those years. Mainly because I kept listening to the stupid council instead of searching the internet for some real helpful advices. Anyway, I eventually stumbled into all those civ2-strategies and was overwhelmed how much I missed out on all those years. And I actually was a little surprised that there are still people out ther who spend their time with this "living fossile". So this is the first real GOTM for me (I played some from the archive). Actually I've already finished succesfully (and kept a log for the first time I played, it really helps a lot). Have you started this game already or are you still playing the last GOTM? I had the same experience as you like the way I played civ2. I found CFC 5 years ago and improved my game a lot. I do not really understand your last question, but perhaps I answer it. The GOTM game start as soon as it is posted (normally by me, but sometimes somebody else will do it on my request). So at the moment GOTM 119 is running but the deadline is next week. GOTM 120 is running also but there is still one month left. In april I will start the next GOTM and is started. I meant to ask wether any of you actually had started playing this GOTM (120), since nobody started the spoiler thread so far and most of you still seem to be playing GOTM119. I just finished GOTM 119 and will start GOTM 120 soon. I know that 1 person already finished GOTM 120 but don't know which players started GOTM 120 already. It's ok to start a spoiler thread if you have played beyond 1 AD. Hello Major Advantage and welcome. I am always glad to see another GOTM player. Your experience before and after discovering this forum is shared by almost all of us. I have not started GOTM 120 yet. I will as soon as I finish GOTM 119. I'll probably have to skip this one. I'm pretty busy with RL til late April, and landing games take too long for my wee attention span anyway. I am pressed for real time as well. GOTM 119 took a lot of time but this one will not simply because the world size is super small: 1225 tiles. 60 cities with no overlap would need more tiles (1260). We should play games on small maps more often. Our maps are often quite large and they make for very long games. I agree on this and will certainly start more small map games. This way it's easier to play all/most games. The results are up. You can find them here. It was a pretty close call between the numbers one, two and three / green and blue star but congratz to AliArdavan with a gold medal and green star. Thank you Magic. It is my very first Green Star and I am far happier about that than I am about the gold. A triumph and example to us all!